Woodland on the edge of heathland; now the quietest part of Suffolk, this was once the most populous area in England. Here came the Angles and the Frisians, the Saxons and the Jutes, quietly and industriously up the estuaries and river valleys, reclaiming the land the Romans had abandoned, clearing acres of forest and bringing them under cultivation, settling down. And we're still here, of course. 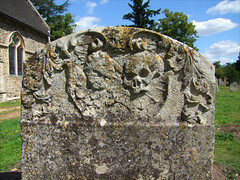 But this part of Suffolk now is one of tiny villages, and many redundant churches. St Mary is not redundant, but I didn't see a single soul on my journey across its parish. Incidentally, it wasn't the size of the population which gave East Anglia so many parishes, and so many parish churches. It was a result of the Anglo-Saxon manorial system. Because Norfolk, Suffolk and Essex were the first places to be settled, the manors tended to be very small, crowding together on river banks and in forest clearings. Each manor had its own church. 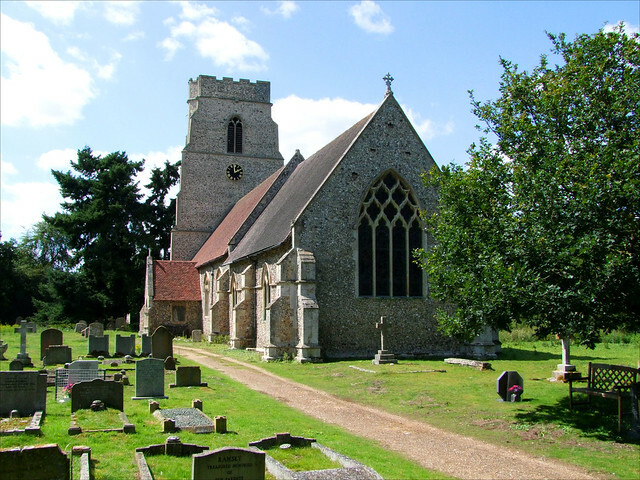 The parishes were based on the manors, and although virtually nothing survives of the Saxon buildings, the parishes themselves survive and in most cases the churches we see today were built on the sites of Saxon predecessors. You don't have to go far to see what those Saxon villages were like, for not far from this church is West Stow Anglo-Saxon Village, a reconstruction which is regularly populated by Anglo-Saxon characters going about their Anglo-Saxon activities on open days. It's well worth a visit. 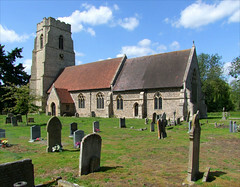 St Mary sits in a wide graveyard, the outer edges wild, and merging into the forest. It was as if this was a clearing that some 7th Century Angle had hacked out and made safe for theocracy - and perhaps it is. Rabbits scampered away as I approached, leaving me to birdsong and the silence of the graves. You approach the large, ship-like church from the east, and it unfolds before you, leading you to its blockish 14th Century tower. This largely 14th and 15th century church was mostly derelict by the early 19th century, as so many were around here. The Victorians stepped in and saved it. When I first came this way in the 1990s, the church was kept locked without a keyholder notice, but now you can pick one up from the nice people across the road. You let yourself in to what is above all else a 19th Century interior, but a pleasantly rustic one. You can imagine West Stow's shepherds and ploughmen shuffling uncomfortably on the benches in the last years of the old queen's reign. The keyring also has the key to the vestry, and if you open the door you can look back at the oldest part of the building, the very early Norman north doorway which was already half a millennium old by the time of the Reformation. 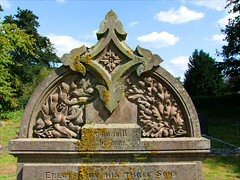 It is similar to the one across the fields at Wordwell. At the other end of the Middle Ages is the church's great other medieval survival, the canopied and cusped piscina in the sanctuary. The sill to the west of it is all that survives of what was probably a matching sedilia. The 19th Century communion rail is pleasingly carved. The glass to north and south unusually depicts scenes of people being brought back to life: Peter raises Tabitha from the dead, Paul raises Eutychus, Christ raises Lazarus and in the final scene the three Marys are greeted by the angel at the empty tomb. Old Testament characters appear in vignettes in the upper lights. In the East Window, Christ performs miracles. In the 1930s, Cautley traced St Mary's rood screen dado to the reserve collection of the Victoria and Albert Museum in London. It was donated, presumably after the 19th century restoration, as an exemplar of East Anglian rood screen woodwork. Unusually for Cautley, he didn't march in with guns blazing, retrieve it, and force the churchwardens to reinstall it (or perhaps he tried to, and the museum wouldn't let him have it). This is a pity, because it would have made a welcome addition to a church which is not dull but lacks a real sense of the numinous. A late 16th Century brass inscription by the pulpit remembers Rector William Boyce: His heart stopped, and now the grave holds his body and Christ his soul.